The Soufrière Hills, a volcano on the island of Montserrat, in the Lesser Antilles island chain in the Caribbean Sea, has been active since 1995. The most recent eruptive phase of the volcano began with a short swarm of volcano-tectonic earthquakes—earthquakes thought to be caused by movement of magma beneath a volcano—on October 4, 2009, followed by a series of ash-venting events that have continued through October 13, 2009. These venting events create plumes that can deposit ash at significant distances from the volcano. In addition to ash plumes, pyroclastic flows and lava dome growth have been reported as part of the current eruptive activity. This oblique astronaut photograph from the International Space Station (ISS) captures a white-to-gray ash and steam plume extending westwards from the volcano on October 11, 2009. Oblique images are taken by astronauts looking out from the ISS at an angle, rather than looking straight downward toward the Earth (a perspective called a nadir view), as is common with most remotely sensed data from satellites. An oblique view gives the scene a more three-dimension quality, and provides a look at the vertical structure of the volcanic plume. While much of the island is covered in green vegetation, gray deposits that include pyroclastic flows and volcanic mudflows (lahars) are visible extending from the volcano toward the coastline. When compared to its extent in earlier views, the volcanic debris has filled in more of the eastern coastline. Urban areas are visible in the northern and western portions of the island; they are recognizable by linear street patterns and the presence of bright building rooftops. The silver-gray appearance of the Caribbean Sea surface is due to sunglint, which is the mirror-like reflection of sunlight off the water surface back towards the handheld camera onboard the ISS. The sunglint highlights surface wave patterns around the island. Astronaut photograph ISS021-E-5555 was acquired on October 11, 2009, with a Nikon D2Xs digital camera fitted with a 400 mm lens, and is provided by the ISS Crew Earth Observations experiment and Image Science & Analysis Laboratory, Johnson Space Center. The image was taken by the Expedition 21 crew. The image in this article has been cropped and enhanced to improve contrast. Lens artifacts have been removed. The International Space Station Program supports the laboratory to help astronauts take pictures of Earth that will be of the greatest value to scientists and the public and to make those images freely available on the Internet. Additional images taken by astronauts and cosmonauts can be viewed at the NASA/JSC Gateway to Astronaut Photography of Earth. Caption by William L. Stefanov, NASA-JSC. 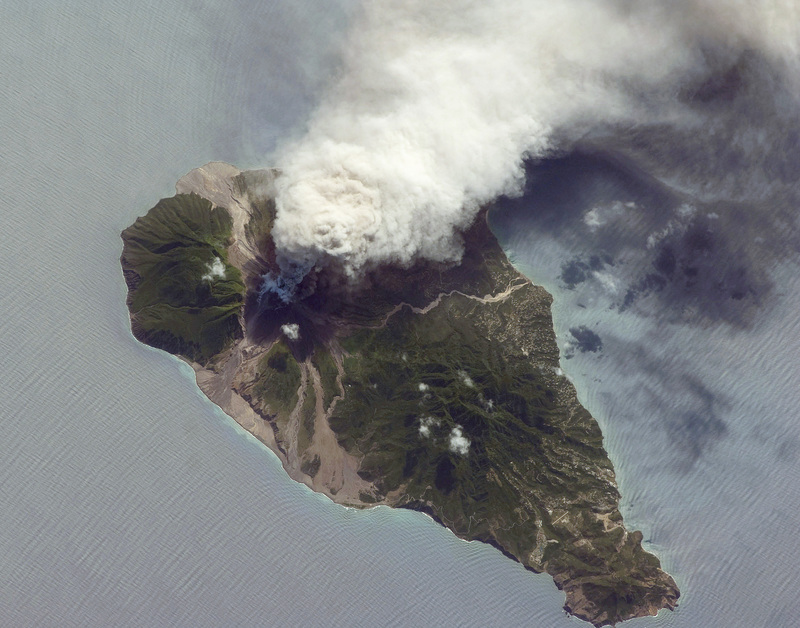 An oblique photo of Montserrat Island taken by astronauts captures an eruption from the island’s Soufrière Hills Volcano on October 11, 2009. 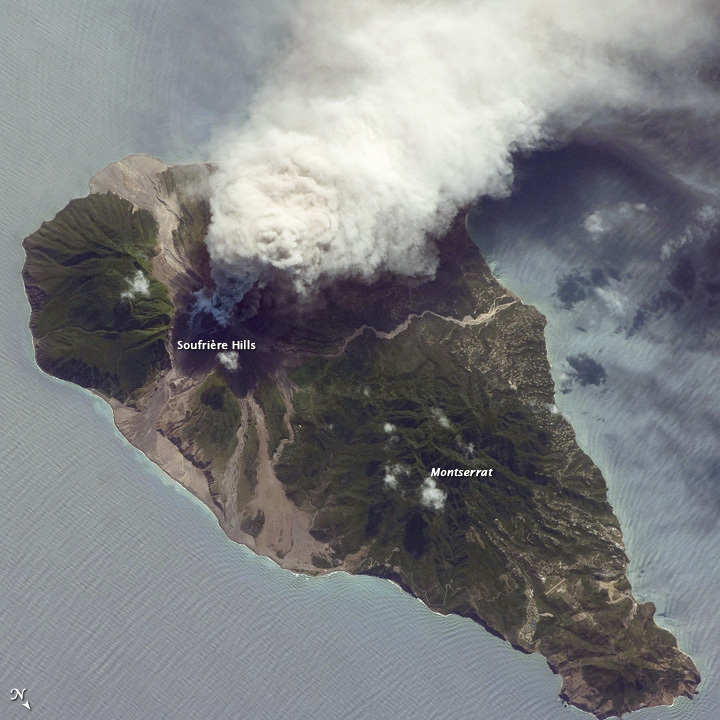 After 10 months of relative quiet, Soufriere Hills Volcano on the Caribbean island Montserrat resumed activity in early October 2009. It remained active in early 2010, covering large areas with pyroclastic flows.